(Nanowerk News) For the first time, the wavelike behaviour of a room-temperature polariton condensate has been demonstrated in the laboratory on a macroscopic length scale. This significant development in the understanding and manipulation of quantum objects is the outcome of a collaboration between Professor Stéphane Kéna-Cohen of Polytechnique Montréal, Professor Stefan Maier and research associate Konstantinos Daskalakis of Imperial College London. Their work has been published in the prestigious journal Physical Review Letters ("Spatial Coherence and Stability in a Disordered Organic Polariton Condensate"). Quantum mechanics tells us that objects exhibit not only particle-like behaviour, but also wavelike behaviour with a wavelength inversely proportional to the object's velocity. Normally, this behaviour can only be observed at atomic length scales. There is one important exception, however: with bosons, particles of a particular type that can be combined in large numbers in the same quantum state, it is possible to form macroscopic-scale quantum objects, called Bose-Einstein condensates. These are at the root of some of quantum physics' most fascinating phenomena, such as superfluidity and superconductivity. Their scientific importance is so great that their creation, nearly 70 years after their existence was theorized, earned researchers Eric Cornell, Wolfgang Ketterle and Carl Wieman the Nobel Prize in Physics in 2001. Placing particles in the same state to obtain a condensate normally requires the temperature to be lowered to a level near absolute zero: conditions achievable only with complex laboratory techniques and expensive cryogenic equipment. "Unlike work carried out to date, which has mainly used ultracold atomic gases, our research allows comprehensive studies of condensation to be performed in condensed matter systems under ambient conditions" explains Mr. Daskalakis. He notes that this is a key step toward carrying out physics projects that currently remain purely theoretical. To produce the room-temperature condensate, the team of researchers from Polytechnique and Imperial College first created a device that makes it possible for polaritons - hybrid quasi-particles that are part light and part matter - to exist. The device is composed of a film of organic molecules 100 nanometres thick, confined between two nearly perfect mirrors. The condensate is created by first exciting a sufficient number of polaritons using a laser and then observed via the blue light it emits. Its dimensions can be comparable to that of a human hair, a gigantic size on the quantum scale. "To date, the majority of polariton experiments continue to use ultra-pure crystalline semiconductors," says Professor Kéna-Cohen. 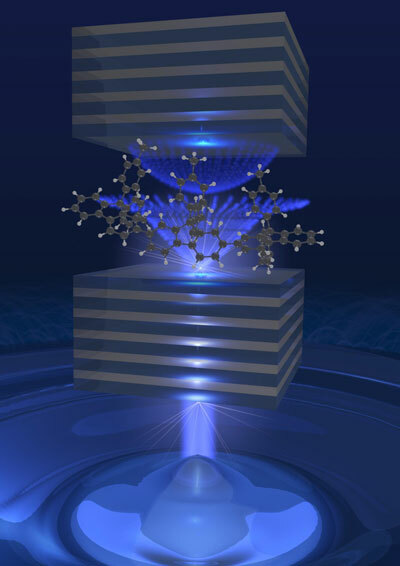 "Our work demonstrates that it is possible to obtain comparable quantum behaviour using 'impure' and disordered materials such as organic molecules. This has the advantage of allowing for much simpler and lower-cost fabrication." In addition to directly observing the organic polariton condensate's wavelike behaviour, the experiment showed researchers that ultimately the condensate size could not exceed approximately 100 micrometres. Beyond this limit, the condensate begins to destroy itself, fragmenting and creating vortices. In a condensate, the polaritons all behave the same way, like photons in a laser. The study of room-temperature condensates paves the way for future technological breakthroughs such as polariton micro-lasers using low-cost organic materials, which are more efficient and require less activation power than conventional lasers. Powerful transistors entirely powered by light are another possible application. The research team foresees that the next major challenge in developing such applications will be to obtain a lower particle-condensation threshold so that the external laser used for pumping could be replaced by more practical electrical pumping. According to Professor Maier, this research is also creating a platform to facilitate the study of fundamental questions in quantum mechanics. "It is linked to many modern and fascinating aspects of many-body physics, such as Bose-Einstein condensation and superfluidity, topics that also intrigue the general public," he notes. Professor Kéna-Cohen concludes: "One fascinating aspect, for example, is the extraordinary transition between the state of non-condensed particles and the formation of a condensate. On a small scale, the physics of this transition resemble an important step in the formation of the Universe after the Big Bang."